Enjoy Exclusive Rewards w/ PNB ~ Philippine Freebies, Promos, Contests and MORE! Christmas is coming! 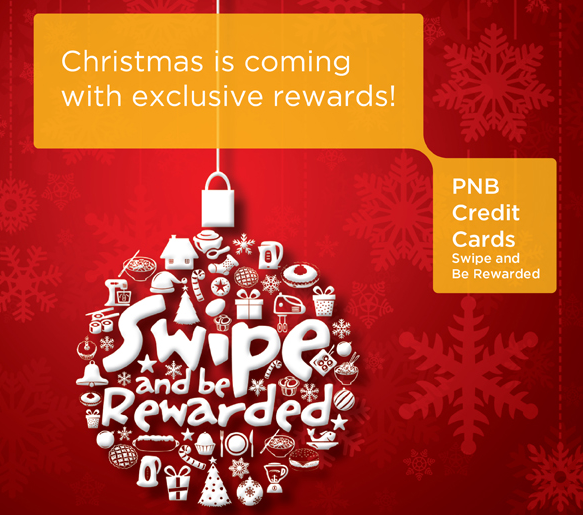 It's time once again to swipe and enjoy exclusive rewards when you go on shopping using your PNB card. Avail P100, P300, or P500 discount from KyoChon, Ikkoryu Fukuoka Ramen, and Royce' for single-receipt purchases worth P2,000, P6,000, or P10,000 respectively. Not only that. Spend higher and get an exclusive treat or stay at Century Park Hotel. Enjoy a FREE lunch or dinner buffet with unlimited iced tea at Cafe in the Park when you swipe at least P25,000. On the other hand, an exclusive overnight hotel vacation in a Deluxe Room with buffet breakfast for two entitles those who made purchases worth P90,000.